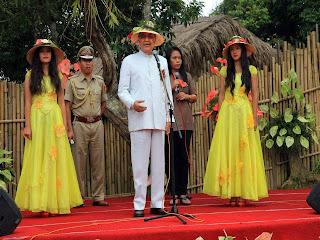 Aizawl, Sep 21 : The three-day Anthurium Festival of Mizoram began today with a riot of colours at the green-covered Reiek tourist resort with Mizoram governor reiterating Mizoram too is God's own country, likening it to his home state of Kerala.
" Mizoram is a beautiful place with wonderful climate with beautiful cultures. If we can tap these potential to attract tourists, we can make Mizoram God's Own Country of the East, " Purushothaman said. 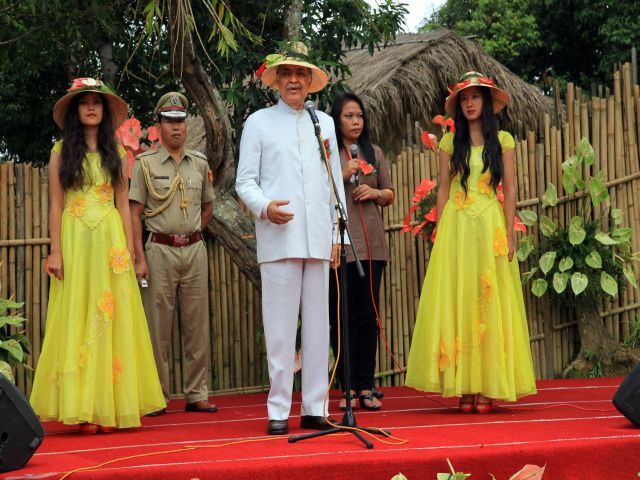 He appreciated the idea to organise Anthurium festival to attract tourists as Anthurium flowers have made Mizoram famous. The three-day festival is funded by the ministry of tourism with an aim to promote tourism industry in Mizoram since 2009. Reddish Anthurium flowers and the beautiful traditional attires were the colours of the day. Different tribes, Mizo, Lai, Gorkha and Chakma showcased their cultural dances. The festival will last till Saturday.